TLJ News: July 26-31, 2012. 7/31. Sen. Frank Lautenberg (D-NJ) and other Senate Democrats introduced S&3458 [LOC | WW]. Also, Rep. Carolyn McCarthy (D-NY) and other House Democrats introduced HR 6241 [LOC | WW]. These substantially identical bills are both titled the "Stop Online Ammunition Sales Act of 2012". These bills would do many things, one of which would be to ban internet sales of ammunition to consumers. These bills would amend Title 18, the criminal code. Chapter 44 of Title 18 pertains to "Firearms". These bills would make numerous amendments to sections within Chapter 44. The sponsors tout this bill for barring consumers from making retail purchases of ammunition online. Actually, the bill would increase regulation of transactions involving weapons and ammunition in other ways. Introduction of these bills follow the July 20, 2012, shooting in Aurora, Colorado. The defendant acquired ammunition online. These bills would not only ban internet sales of ammunition, but broadly expand the existing firearms regulatory regime. However, the other provisions do not implicate the internet or e-commerce, and hence, are not addressed in this story. Nevertheless, their presence may reduce the likelihood that these bills would be enacted into law. On the other hand, to the extent that this bill would have the effect of curtailing secondary markets in ammunition, and manufacturers often have reasons to dislike secondary markets, especially internet based markets, these bills could win the support of some industry stakeholders. The statute regulates, among other things, "dealers". The statute defines dealers as dealers in weapons. This bill would amend the definition of dealer to also include ammunition. That is, ammunition sales would be incorporated into the existing regulatory regime for weapons sales. The key language in these bills, affecting e-commerce, would provide that "It shall be unlawful ... for ... a licensed importer, licensed manufacturer, or licensed dealer to transfer ammunition to a person unless the licensed importer, licensed manufacturer, or licensed dealer has verified the identity of the transferee by examining a valid identification document ... of the transferee containing a photograph of the transferee". Examining an identification document requires a face to face meeting, and hence, would have the effect of banning internet, as well as catalogue and other remote sales. These bill would also restrict sales of ammunition by anyone except a licensed importer, licensed manufacturer, or licensed dealer. Thus, ordinary individuals in possession of ammunition could not sell in online secondary markets, or even face to face. These bills would not impact either eBay or Amazon sales, because of their existing policies. eBay's policy titled "Firearms, weapons, and knives policy" already prohibits sale of ammunition, including dummy and inert ammunition. It does allow sales of "Ammunition for BB guns, pellet guns, or airsoft guns" and "Plastic, polymer, rubber, or wooden bullets or ammunition". Similarly, Amazon's policy titled "Weapons" prohibits sales of ammunition, including blanks and powder. Amazon does allow sales paintball guns, BB guns, and pellet guns, and ammunition for these. These bills would have no impact upon internet sales things other than ammunition. Sen. Lautenberg stated in a release that "It's one thing to buy a pair of shoes online, but it should take more than a click of the mouse to amass thousands of rounds of ammunition. This legislation is a simple common-sense step that would put safeguards in place to detect suspicious activity, helping to prevent the sale of ammunition to a terrorist or the next would-be mass murderer." The other original cosponsors of the House bill are Rep. Dianne DeGette (D-CO), Rep. John Conyers (D-MI), Rep. Rush Holt (D-NJ), Rep. Chris Van Hollen (D-MD), Rep. Ed Markey (D-MA), Rep. Carolyn Maloney (D-NY), Rep. Janice Hahn (D-CA), Rep. Jerrold Nadler (D-NY), Rep. John Tierney (D-MA), Rep. David Cicilline (D-RI), Rep. James Moran (D-VA), Rep. Anna Eshoo (D-CA0, Rep. Nita Lowey (D-NY), Rep. Keith Ellison (D-MN), Rep. Raul Grijalva D-AZ), and Rep. Jose Serrano (D-NJ). The House bill was referred to the House Judiciary Committee (HJC). 7/31. The Senate Homeland Security and Governmental Affairs Committee's (SHSGAC) Subcommittee on Oversight of Government Management held a hearing titled "State of Federal Privacy and Data Security Law: Lagging Behind the Times?". Sen. Daniel Akaka (D-HI) wrote in his opening statement that the Privacy Act (PA) and its interpretation by the courts is "out of date", for example, because damages for violation of the PA are limited to economic harm, and because federal agencies remain free to use private sector databases. He also noted that the OMB has not had a chief privacy officer since the Clinton administration, that "responsibility for protecting privacy is fragmented and agencies' compliance with privacy requirements is inconsistent", and that agency data breaches are "widespread". He is the sponsor of S 1732 [LOC | WW], the "Privacy Act Modernization for the Information Age Act". Sen. Tom Carper (D-DE) wrote in his opening statement that there is a "need for Federal data security standards". See also, prepared testimony of Mary Ellen Callahan (DHS Chief Privacy Officer), prepared testimony of Greg Long (Federal Retirement Thrift Investment Board), prepared testimony [22 pages in PDF] of Greg Wilshusen (Government Accountability Office), prepared testimony of Peter Swire (Ohio State University law school), prepared testimony of Chris Calabrese (ACLU), and prepared testimony of Paul Rosenzweig (Heritage Foundation). 7/31. The Federal Trade Commission (FTC) released a statement that announces that the FTC has withdrawn its 2003 policy statement regarding the pursuit of monetary equitable remedies, including disgorgement and restitution, in competition cases. The vote was 4-1, with FTC Commissioner Maureen Ohlhausen dissenting. This action suggests that the FTC may more frequently seek disgorgement of profits from allegedly anticompetitive conduct, rather than relying solely on structural and behavioral remedies. The just released statement mentions no cases or types of cases. However, it might be noted that this action might signal FTC anticipation of what remedies it will seek if, or when, it takes action against Google regarding its online search practices. The FTC is investigating whether Google is using its market share and market power in online search to steer users to its own web products and secondary services, and discriminating against other web sites with which it competes, in violation of the Sherman Act and/or FTC Act. The FTC adopted this item, titled "Policy Statement on Monetary Equitable Remedies in Competition Cases", on July 25, 2003, by a 5-0 vote. The FTC did not request comments on this matter, or provide public notice that it would consider taking this action. The 2003 policy statement announced that the FTC "will consider the following three factors in determining whether to seek disgorgement or restitution in a competition case. First, the Commission will ordinarily seek monetary relief only where the underlying violation is clear. Second, there must be a reasonable basis for calculating the amount of a remedial payment. Third, the Commission will consider the value of seeking monetary relief in light of any other remedies available in the matter, including private actions and criminal proceedings. A strong showing in one area may tip the decision whether to seek monetary remedies. For example, a particularly egregious violation may justify pursuit of these remedies even if there appears to be some likelihood of private actions. Moreover, the pendency of numerous private actions may tilt the balance the other way, even if the violation is clear." The vote in 2003 was 5-0. See, story titled "FTC Releases Policy Statement on Use of Equitable Remedies of Disgorgement and Restitution in Competition Cases" in TLJ Daily E-Mail Alert No. 709, August 1, 2003. The just released statement asserts that "the practical effect of the Policy Statement was to create an overly restrictive view of the Commission's options for equitable remedies". It elaborates that "Because the ordinary purpose and effect of anticompetitive conduct is to enrich wrongdoers at the expense of consumers, competition cases may often be appropriate candidates for monetary equitable relief. Although our decisions and orders generally focus on structural or behavioral remedies intended to curb future competitive harm, the agency’s mission to protect consumers and competition also includes, where appropriate, taking action to remedy the actual, realized effects of antitrust violations." Ohlhausen (at left) wrote in her dissenting statement that "I have not been presented with any evidence that the Policy Statement has inappropriately constrained the Commission in the nine years it has been in effect. This begs the questions why the agency needs to rescind the Policy Statement now and why it should not perhaps be revised rather than rescinded altogether." FTC v. Perrigo Co., U.S. District Court (DC), D.C. No. 1:04CV1397. See, FTC web page with hyperlinks to pleadings. The FTC alleged horizontal market allocation by drug makers. FTC v. Lundbeck, Inc., U.S. District Court (DMinn), D.C. No. 08-6379. See, FTC web page with hyperlinks to pleadings. The FTC alleged anticompetitive acquisition of rights in two drugs. The FTC lost in the District Court, and in the U.S. Court of Appeals (8thCir). See, August 19, 2011 opinion of the Court of Appeals. Just prior to the adoption of the 2003 policy statement, the FTC sought disgorgement in a case involving electronic databases, FTC v. The Hearst Trust, U.S. District Court (DC), D.C. No. 1:01CV00734. See, FTC web page with hyperlinks to pleadings. FTC Commissioners Orson Swindle and Thomas Leary dissented from the FTC's decision to bring that action. In particular, they objected to seeking disgorgement. They wrote in their dissent that "Without expressing a view on whether that extraordinary remedy should ever be available in an antitrust case, we believe that, if a violation is proved, existing private remedies are adequate to ensure that respondents do not benefit from any possible wrongdoing and that their customers can be made whole." Patent Litigation. Recently, he briefed, argued and won a patent case before the Supreme Court. He is a partner in the Houston and Washington DC offices of the law firm of Morgan Lewis. He represented SEB in Global Tech Appliances v. SEB., a case regarding inducement of patent infringement under 35 U.S.C. § 271(b), which provides that "Whoever actively induces infringement of a patent shall be liable as an infringer." See, SEB's brief. 7/31. The Federal Communications Commission (FCC) released an Order [23 pages in PDF] implementing the public safety spectrum provisions of the "Middle Class Tax Relief and Job Creation Act of 2012", enacted in February. This act requires the creation of an interoperable public safety broadband network using the existing public safety broadband spectrum (763-769 MHz/793-799 MHz) and the D Block (758-763 MHz/788-793 MHz). See, stories titled "Obama Signs Spectrum Bill into Law" in TLJ Daily E-Mail Alert No. 2,345, February 23, 2012, "House and Senate Negotiators Reach Agreement on Spectrum Legislation", "Summary of Spectrum Bill", and "Reaction to Spectrum Bill" in TLJ Daily E-Mail Alert No. 2,339, February 17, 2012, and story titled "House and Senate Pass Spectrum Bill" in TLJ Daily E-Mail Alert No. 2,340, February 18, 2012. The order notes that before passage of the act, "some public safety jurisdictions were on the verge of implementing statewide or regional networks designed ultimately to support such nationwide interoperability". The order approves the interoperability showings of the Harris County, Texas and the City of Charlotte, North Carolina. FCC Chairman Julius Genachowski wrote in his statement that this order "provides a well-defined path for obtaining Special Temporary Authority (STA) where it is warranted and consistent with the statute." FCC Commissioner Robert McDowell only concurred. He wrote in his statement that "I am disappointed with the one-size-fits-all approach set forth here." He wrote that "Ideally, the Commission would have addressed the existing public safety build-out waivers, as well as the pending requests for waiver, on a case-by-case basis back in March, immediately following passage of the Public Safety Spectrum Act. Acting quickly would have allowed the stakeholders a meaningful opportunity to socialize the legislation and its effect – internally with their management teams, their lenders, and their equipment vendors – and externally, with local government officials and Commission staff. Instead, given the significant passage of time, the Commission has found itself in an untenable position: It can only sweep away all of the waivers, along with the pending requests, and establish a process to obtain a “limited” Special Temporary Authorization (STA) only “in very few instances” where the highly subjective criteria set forth in the order are met." FCC Commissioner Ajit Pai wrote in his statement that he only concurs in the bulk of the order "due to the decision to terminate existing leases on September 2 -- just one month from now -- in favor of the prospect of agency granted special temporary authority (STA) that could enable lessees to finish building out and start operating their networks. Federal law does not mandate this result." This order is FCC 12-85 in PS Docket No. 12-94, WT Docket No. 06-150, and PS Docket No. 06-229. The FCC adopted its on July 30, 2012, and released it on July 31, 2012. 7/31. The House considered HR 3120 [LOC | WW], the "Student Visa Reform Act", HR 6029 [LOC | WW], the "Foreign and Economic Espionage Penalty Enhancement Act of 2012", HR 6063 [LOC | WW], the "Child Protection Act of 2012", and HR 4362 [LOC | WW], the "STOP Identity Theft Act of 2012". The House debated these bills late in the day, and postponed votes until Wednesday, August 1. 7/31. The Senate Commerce Committee (SCC) held an executive session at which it approved S 3410 [LOC | WW], a bill to extend the "Undertaking Spam, Spyware, And Fraud Enforcement with Enforcers beyond Borders Act of 2006", which is also known as the "SAFE WEB Act". The House Commerce Committee (HCC) is scheduled to mark up its version of this legislation, HR 6131 [LOC | WW], on Wednesday, August 1. 7/31. The U.S. Patent and Trademark Office (USPTO) announced in a release that it has selected nine more law schools to join the Trademark Law School Clinic Certification Pilot Program. 7/31. The Federal Communications Commission (FCC) adopted and released an order and consent decree [12 pages in PDF] that fines (nominally a "voluntary contribution") Cellco Partnership dba Verizon Wireless (VW) $1.25 Million for violating the FCC's C Block rules, which provide that C Block licensees (VW uses C Block spectrum for its 4G LTE service) shall not restrict the ability of their customers to use the devices and applications of their choice. VW endeavored to block its customers from accessing tethering applications. See also, FCC release, statement by FCC Commissioner Mignon Clyburn, and release of the Free Press, which filed a complaint with the FCC. "DOJ Report Discusses FBI's Failures in Creating a Secure Web Accessed File System" in TLJ Daily E-Mail Alert No. 1,499, December 5, 2006. "GAO Releases Report on FBI IT Deployment Project" in TLJ Daily E-Mail Alert No. 1,834, September 29, 2008. "DOJ OIG Reports on FBI's IT Adoption Problems" in TLJ Daily E-Mail Alert No. 2,016, November 17, 2009. "DOJ/OIG Again Reports on FBI's Failure to Implement IT Project" in TLJ Daily E-Mail Alert No. 2,146, October 25, 2010. 7/30. The House Commerce Committee (HCC) released a paper titled "Promises Made, Promises Broken: The Obama Administration’s Disappointing Transparency Track Record". It states that "In October 2008, then Senator Obama and his surrogates repeatedly stated that meetings between lobbyists and the staff of regulatory agencies should be made public." But then, for example, "A White House official specifically organized meetings related to the LightSquared/GPS interference dispute off White House grounds in order to avoid public disclosure on the visitors' logs." Moreover, the paper states that White House officials use personal e-mail accounts to avoid creating an electronic record. It might also be noted that while the Federal Communications Commission (FCC) has rules that allow entities and people to make ex parte communications, it requires them to minimally disclose such contacts. However, these rules exempt communications with members of Congress and Congressional committees. Neither the FCC nor the Congress disclose all such meetings and contacts. Moreover, the Lobbying Disclosure Act and the Congress's ethics rules do not hold members of Congress and lobbyists to the same standards of transparency that this report faults the Executive Office of the President for violating. 7/30. The Senate Commerce Committee (SCC) approved the nomination of Patricia Falcone to be Associate Director of the Executive Office of the President's (EOP) Office of Science and Technology Policy (OSTP). 7/30. The U.S. Patent and Trademark Office (USPTO) released a notice to be published in the Federal Register that announced and describes rules adopted, pursuant to the America Invents Act, regarding USPTO disciplinary actions. See also, USPTO release. 7/27. The Copyright Office (CO) published a notice in the Federal Register (FR) requesting comments regarding proposed changes to CO regulations for reporting Monthly and Annual Statements of Account for the making and distribution of phonorecords under the compulsory license. The deadline to submit initial comments is September 25, 2012. The deadline to submit reply comments is October 25. See, FR, Vol. 77, No. 145, Friday, July 27, 2012, at Pages 44179-44197. 7/26. Rep. John Conyers (D-MI) and Rep. Jason Chaffetz (R-UT) introduced HR 6210 [LOC | WW], the "American Investment and Job Creation Act". This bill would amend the Immigration and Nationality Act to direct the Department of Homeland Security's (DHS) U.S. Citizenship and Immigration Services (USCIS) to hand out visas to entrepreneurs and job creators. It was referred to the House Judiciary Committee (HJC). Rep. Chaffetz stated in a release that "This bill does not increase the number of visas available. It refocuses current immigration laws to provide opportunities for highly educated and skilled entrepreneurs to establish small businesses." This release explains that "Current immigration laws provide 140,000 annual ``employment-based´´ green cards for needed workers in our economy. Immigrant entrepreneurs who start businesses and create jobs are only eligible for temporary visas, such as E-2 ``treaty investor visas.´´ H.R. 6210 would allow entrepreneurs to qualify for existing employment-based green cards." This bill would amend 8 U.S.C. § 1153, which pertains to allocation of immigrant visas. Subsection (b) provides for preference allocation for employment based immigrants. Subsection (b)(2), which this bill would revise, pertains to "Aliens who are members of the professions holding advanced degrees or aliens of exceptional ability". As another example, the language limiting liability for doing things "authorized" by the bill, such as sharing "lawfully obtained" information, does not necessarily put entities on notice as to when the limitation of liability would apply. What is authorized by the bill is not always clear. Moreover, this section is littered with terms such as "reasonable", "good faith", and "negligence". 7/26. S 3414 [LOC | WW | PDF], the "Cybersecurity Act of 2012", or "CSA", introduced on July 19, 2012, is too long and complex to summarize in a story. Nevertheless, the following touches on some of the more important provisions. 7/26. Sen. Joe Lieberman (D-CT) and others introduced S 3414 [LOC | WW | PDF], the "Cybersecurity Act of 2012", or "CSA" on July 19, 2012. It is 214 pages long, but some groups and companies have been involved in negotiatioins, and/or studied the bill, and offered comments. 7/26. Facebook, Inc., filed a Form 8-K and attached release with the Securities and Exchange Commission (SEC). These disclose financial results for the quarter ended June 30, 2012. This is Facebook's first such filing since its initial public offering. See also, PDF version of the release [10 pages] in the Facebook website. Facebook stated, "For the second quarter, GAAP loss from operations was $743 million". In contrast, the 2011 Q2 GAAP gain was $407 Million. However, in the 2012 Q2 Facebook "recognized $1.3 billion of share-based compensation and related payroll tax expenses". Facebook reported 2012 Q2 GAAP revenue of $1,184 Million, up from $895 Million in 2011 Q2. 7/26. The Government Accountability Office (GAO) released a report [45 pages in PDF] titled "Electronic Health Records: Number and Characteristics of Providers Awarded Medicare Incentive Payments for 2011 ". This report pertains to federal subsidies for hospitals, doctors, dentists, chiropractors and other health care professionals for the purpose of promoting the adoption and use of information technology (IT), including electronic health records (EHR) technology. The Congress enacted this subsidy program in the "Health Information Technology for Economic and Clinical Health (HITECH) Act", which was part of HR 1 [LOC | WW], the huge spending bill passed by the Congress in February of 2009 at the beginning of 111th Congress. It is Public Law No. 111-5. See, Division A, at Title XIII. This report states that "761 hospitals and 56,585 professionals were awarded a total of approximately $2.3 billion in Medicare EHR incentive payments for 2011. These 761 hospitals represented 16 percent of the estimated 4,855 eligible hospitals, and were awarded $1.3 billion in Medicare EHR incentive payments for 2011." This GAO report provides details on federal payments. It does not attempt to measure the effect of these payments on efficiency or costs of hospitals and health care professionals, or even the effect on adoption of IT or EHR. 7/26. The Senate Judiciary Committee (SJC) held an executive business meeting at which it held over consideration of S 225 [LOC | WW], the "Access to Information About Missing Children Act of 2011". This bill is again on the SJC's agenda for its executive business meeting on August 2, 2012. 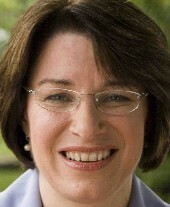 Sen. Amy Klobuchar (D-MN), the sponsor of the bill, stated at the meeting that this bill would "untie the IRS's hands". Sen. Klobuchar (at right) said that it would enable local law enforcement officials to obtain access to federal income tax returns filed with the Internal Revenue Service (IRS) in cases involving abductions of children by family members who file accurate tax returns that list their addresses and dependent children. However, the text of the bill does not reference the IRS or tax returns. It would enable local law enforcement access to information of any federal agency. Moreover, it would also enable any federal officer to obtain access to information of any federal agency. For an explanation of this bill, see story titled "Senate Judiciary Committee to Take Up Access to Federal Information Bill" in TLJ Daily E-Mail Alert No. 2,410, July 24, 2012. 7/26. The Senate Judiciary Committee (SJC) held an executive business meeting at which it held over consideration of three nominees for the U.S. District Court: Jon Tigar (USDC/NDCal), William Orrick (USDC/NDCal), and Thomas Durkin (USDC/NDIll). The three are again on the SJC's agenda for its executive business meeting on August 2, 2012. 7/26. Rep. Richard Nugent (R-FL) introduced HR 6205 [LOC | WW], the "Protect and Save Act of 2012", a bill related to identity theft. It was referred to the House Ways and Means Committee. Go to News from July 21-25, 2012.